Lymph is a fluid in the body that lies close to the skin. Lymphatic fluid travels the body through lymph capillaries. Eventually, the lymphatic fluid reaches a lymph node where bacteria that has been picked up can be destroyed. The lymphatic system also transports fats from the digestive system. The lymphatic fluid can become sluggish because it is thick with toxins. It can stop draining properly and lead to sickness in the body. Often times, a backed up lymph system can be painful to the touch and appear slightly swollen or puffy. People who experience bags under their eyes or have bad sinuses often are having an issue with lymph drainage in the face. 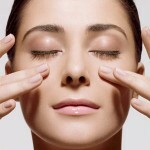 I have had the fortunate experience to receive both a lymphatic drainage massage and facial. Both of which I thought were wonderful. The massage itself is done with a very light and slow circular touch. Lymphatic drainage massage encourages the natural circulation of the lymph. It is very soothing and can help people to sleep. Going through esthetic school I’ve received a lot of different types of facials and can honestly say this is one of my favorites. If you get a chance to add this service onto your facial, go for it. We can all use a little more relaxation in our lives and this is the perfect way to let go and de-stress. To learn more about lymphatic drainage for the entire body visit my blog post on Beautiful Body Dry Brushing.